Three young adults were killed in the Chapel Hill Shooting in North Carolina, 23-year-old Deah Shaddy Barakat, his wife, Yusor Mohammad Abu-Salha, 21, and her sister, Razan Mohammad Abu-Salha, 19. Two of them were a married couple that had only been married six weeks. Unfortunately there is a shortage of information on North American media outlets. To all politicians who have voiced a concern for the safety of Muslims, who have specified that the ongoing war on terror is not against the overwhelming majority of law abiding Muslims in our society, let us hear you speak. Let us hear you denounce this hate crime, you can start by calling it what it is. 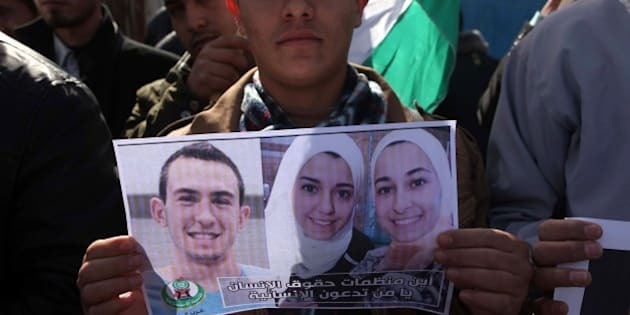 Three young adults were killed in the Chapel Hill Shooting in North Carolina, 23-year-old Deah Shaddy Barakat, his wife, Yusor Mohammad Abu-Salha, 21, and her sister, Razan Mohammad Abu-Salha, 19. Two of them were a married couple that had only been married six weeks. Unfortunately there is a shortage of information on North American media outlets. This story made its rounds on social media. Thankfully, due to the public outcry for information and coverage of this story, major news outlets covered it. I cannot get this story out of my mind. Perhaps it's because of the young age of the victims. Perhaps it's the fact that they were just starting their future together as man and wife, or the fact that they remind me of so many wonderfully talented Muslim professionals in my own community who help others, help their communities and strive to make a difference. Three lives were extinguished. The world deserves to hear their story, to grieve their loss and to remember their legacy. There are 1.6-billion Muslims on the planet. We are learning more about these beautiful souls who have passed. The work they did for their communities and for communities abroad was exemplary. As a society we need to remember this. As a journalist, the importance of maintaining a high level of journalistic integrity when reporting a hate crime, act of terrorism or cold blooded murder should be the same regardless of the faith of the deceased or of the faith of the perpetrator. Society does not demand moderate atheists the world over to denounce this act of terrorism. Why is this cold blooded execution style murder not even being called a hate crime? These are thoughts shared by millions the world over right now. Could it be because the victims, Deah, his wife, Yusor, and her sister, Razan do not represent the burly, secretive, conspiring and dangerous image of Muslims so commonly thrust around in the media? These three young adults happened to be active members of their community, enrolled in university, working hard to make their community a better place. They played basketball, watched football and were in their prime when their lives ended so abruptly. Do their stories not deserve to be told because the fact that they worked with charities, were newly married, were smiling Americans not line up with the propaganda in the media? The suspect who turned himself in to authorities last night described himself as an atheist and regularly posted images and texts against religion in general. There is a blatant disconnect with how this incident has been handled in the media versus any other incident had the faith of the perpetrators been reversed. People have noticed. #ChapelHillShooting was trending on Twitter most of the day following the murder. In fact, Twitter and Facebook became the go to resources for people to get information on the murder. European media did a better job of covering the events then American media. That in itself speaks volumes. For peace loving, law abiding Muslims such as myself, the hypocrisy is overwhelming. When a mentally unstable lunatic goes on a killing spree shortly after declaring themselves Muslim the public scrutiny is immediate. An onus falls upon the Muslim community to publicly condemn horrible acts of terrorism. Expecting a public condemnation from an entire group is unreasonable and senseless. The same way that one cannot reasonably expect that moderate atheists the world over will decry the actions of this murderer, the expectation should be the same for everyone. A death is a death regardless of the person's faith. An act of terrorism where three young adults are shot execution style in the head deserves to be spoken about. Let's not insult the memory of the deceased. They did nothing to deserve their tragic demise. From everything reported on this murder, these three beautiful individuals dedicated much of their lives to service to their communities and to helping to improve communities abroad. To all politicians who have voiced a concern for the safety of Muslims, who have specified that the ongoing war on terror is not against the overwhelming majority of law abiding Muslims in our society, let us hear you speak. Let us hear you start by calling a spade a spade. Let us hear you denounce this hate crime, you can start by calling it what it is.